In task-based business environments, organizations usually conduct knowledge-intensive tasks to achieve organizational goals; thus, knowledge management systems (KMSs) need to provide relevant information to fulfill the information needs of knowledge workers. Since knowledge workers usually accomplish a task in stages, their task-needs may be different at various stages of the task’s execution. Thus, an important issue is how to extract knowledge from historical tasks and further support task-relevant knowledge according to the workers’ task-needs at different task-stages. This work proposes a task-stage mining technique for discovering task-stage needs from historical (previously executed) tasks. 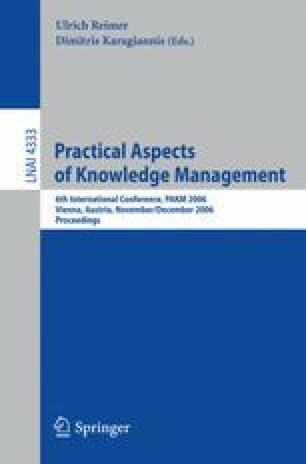 The proposed method uses information retrieval techniques and a modified hierarchical agglomerative clustering algorithm to identify task-stage needs by analyzing codified knowledge (documents) accessed or generated during the task’s performance. Task-stage profiles are generated to model workers’ task-stage needs and used to deliver task-relevant knowledge at various task-stages. Finally, we conduct empirical evaluations to demonstrate that the proposed method provides a basis for effective knowledge support.